...literally every single thing about this room. 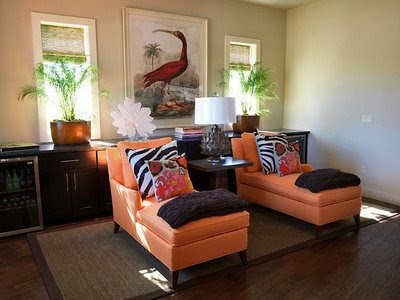 I love the pair of orange chaise lounges. I love the pillows on the orange chaise lounges...especially the zebra ones. I love the large bird art. I love the artichoke lamp. I love the table the artichoke lamp is on. I love the natural rug. I love the color of the wood floors. I love the potted plants in front of each window. I love the bamboo blinds. with a good book and not having to move to get a drink- love it! I love the chocolate brown throws at the end of each orange chaise lounge. See, I told you I loved EVERYTHING about this room. Did I miss anything? The room is so fun! And I just saw that you won the giveaway from Living with Style - congrats!! Great room- it all just works together! I love it too! The bird art is probably my least favorite but I wish I could just sit in one of those chairs. Did you forget about that white thing behind the orange chair on the left? I can't tell what it is but I like it too! You missed the awesome plants that really make the orange pop! I really like the double chaise-lounge setup. I wonder if it would be entirely selfish of me to set this up in our living room (not exactly guest-friendly)! It looks so comfy! but do you LOVE that big empty wall? cuz i don't. everything else though is yummy. and that's saying something for hgtv. Lilah- I say go for it, I mean you are the one that lives there 99% of the time right? Yes, it is missing me lounging with wine! I love this set up. I'm so into it. I'm with you though, I think this room is fabulous. The stylist definitely sold me on the pillows and blankies. And the drinks so close? Magical!